A rare revenue miss led to a sharp correction, but the cloud-based communications specialist actually looks like a solid buy, here. Shares of Vonage Holdings (NYSE:VG) fell 20.1% in November of 2018, according to data from S&P Global Market Intelligence. The network-based communications specialist posted a mixed third-quarter report and offered full-year revenue guidance roughly in line with the current analyst view. Share prices plunged 13% lower that day. Vonage's sales rose 3% year over year to $262 million, just below the Street's $264 million consensus estimate. Adjusted earnings rose 29%, landing at $0.09 per share. Here, your average analyst would have settled for $0.08 per share. Revenue guidance for the full year pointed to roughly $1.05 billion -- a rounding error away from the current analyst view. And yet, the stock plunged on this report. 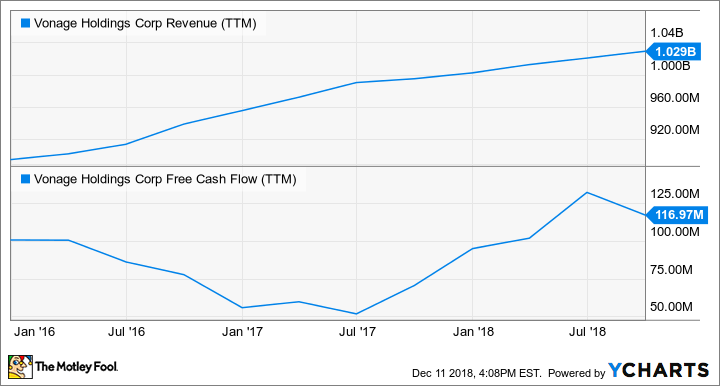 The last time Vonage fell short of a revenue target was in the fall of 2014, so I suppose it makes sense to panic when that particular metric comes up soft. That being said, Vonage was walking the walk. Sales are trending upward over the long run, and the company is making more cash than it spends. VG Revenue (TTM) data by YCharts. The stock is trading at nosebleed valuations, even after November's sharp drop. Let's call it a correction -- maybe even a buying opportunity. This company is going places as the business world moves toward cloud-based voice communications and collaboration tools.